Only a few days, have left for the JKSSB Graduate Level Exam, 2017. JKSSB had released the Admit cards for its exam on 5th March, 2017. If, you haven't yet download the Admit cards, then you should download it as soon as possible and In case, your admit card is not available, then you should contact the JKSSB Office in this regard. Those having their Admit cards, without the Photograph, they should get the photograph attested by Gazetted Officer. Here is the step by step process for Downloading the JKSSB Admit Cards. 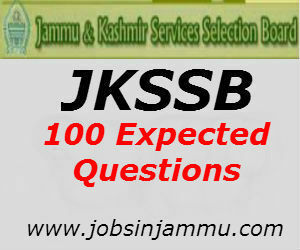 In our previous post on 500 Expected Questions for JKSSB Exams, we have shared the Expected Questions on Indus Water Treaty , RTI Act and Lakes and Rivers of J&K and Today in this post, we will be sharing Next 100 Questions ie 101 to 200 Questions on Power Projects of J&K and Constitution of Jammu and Kashmir. 1) 55 Questions on Power Projects of J&K. 3) Location of Power Projects. 101) The Total Installed Capacity of Jammu and Kashmir in term of Power Generation is? 102) Which of the following countries is associated with Indus Water Treaty? 103) From which year the village electrification programme was made a part of Prime Minister’s Gramodaya Yojana? 105) The 120 MW Hydro Power Project SEWA-II of NHPC in the basholi belt of J&K is located on which of the following rivers? 106) Which of the projects have been handed over to NHPC for execution? 107) Which treaty prohibits reservoir storage of water on major rivers of Jammu and Kashmir? 108) Which of the Projects does not fall under Chenab basin ? 109) Iqbal Hydroelectric Project is located on which river? 110) When was the Jammu and Kashmir State Power Development Corporation Limited is corporate? (c ) Unavailability of Reliable Hydrological data. 112) “Kiru” Power project and “Kawar” Power project which has the capacity of 600 WM and 520 MW respectively has been taken by which of the following corporations? 113) Which of the following statements is/are correct about Jammu and Kashmir State Power Development Corporation Limited? b) Investigation, research, design and preparation of preliminary feasibility and detailed project reports. 115) Which of the following is a part of power projects of Jhleum Basin ? 116) Which centrally Government sponsored scheme provides for Rural Electrification in the state ? 119) Which sector has shown the highest increase in power consumption in the state? 120) When did the Jammu and Kashmir micro/mini hydro power projects came into Existence? 121) Villages in Ladakh are dependent on which of the following for its electricity needs? 122) Solar Energy can be used for which of the following purposes? 123) Salal Hydro Project is located on which river? 124) How much power is estimated to be generated from the geothermal energy? 125) The JKSPDCL is perusing the development of Geo-Thermal Project in Puga Valley in which of the following regions? 126) Which of the following are Non-Conventional sources of energy? 128) What is the increased consumption of power in Industrial sector? 132) Which is currently the biggest Power Generation Project of J&K ? 133) What is the Installed capacity of Baglihar-I ? 134) Uri Dam is built on which river ? 135) Name the Power Projects Operational on Chenab River ? 136) What is the Installed capacity of Salal Hydro electric Project? 137) Where is Nimo Bazgo Power Project Installed ? 138) What is the Installed Capcity of URI-I and URI-II ? 139) Where is Kishanganaga Power Project Located ? 140) Where is Pakal Dul Dam Projected? 141) Over which river Ratle Power Project is projected to be built? 142) What is Installed Capacity of Ratle Power Project? 143) What is the Installed capacity of Nimmo Bazgo Power Project? 144) Which company is working on the development of Nimmo Bazo Power Project? Ans Developed by NHPC while BHEL has executed Electro mechanical works. 145) Over which river Chutak Power Project is built ? 146) What is the Installed capacity of Chutak Power Project? 147) Where Dhumkar Dam is projected to be built? 148) What is proposed installed capacity of Dhumkar Dam? 149) Where in J&K, JKSPDSL has bult the First ever Gas Turbine? 150) In which year, JKSPDS was incorporated as Private Limited Company in J&K? 151) What is the estimated Hydro Potential of J&K in terms of power generation? 152) Over which river, Ranjit Sagar Dam Power Project is Built? 153) Where Stakna Hyrdo electric project is built ? 154) What is the installed capacity of URI-II? 155) In which district Kishanganga Power Project is located? (II ) Expected Questions on Constitution of Jammu and Kashmir. This is one of the most important topics of J&K General Knowledge section and ever year we have 4-5 Questions from this section. Questions in this section are commonly asked on basic knowledge of Topic and Difficulty Level is Easy to Moderate. 156) Who was the president of Drafting Committee? 158 ) When did Jammu and Kashmir Acceded with India? 159) Which section of constitution, describes the Relationship of state with Union of India? 160) How many schedules are these are in the Constitution of J&K? 161) Which section deals with right of permanent residents? 162) In how many parts, Constitution of J&K divided? 163) Under which section Governor rule can be imposed in J&K? 164) Which Section Deals with Right to Free and Compulsory Education? 165) Which is the Official Language of J&K? 166) Which section provides for Separation of Judiciary from Executive? 167) Which section provides for Equality and Secularism? 168) Which section provides the Limit on Legislative and Executive Powers of state? 169) Which Part of Constitutions Deals with Directive Principles of State Policy? 170) Which part of constitution deals with rights of Permanent residents? 171) Which Schedule of J&K’s constitution deals with Regional Languages? 172) Which is the only right that has been added in the Indian Constitutional History and it not extended to J&K? 173) Which Part of Constitution deals with Executive? 174) Which Section provides for provisions related to Pakistan Occupied Kashmir? 177) Which Section provides for appointment of Governor? 178) Which Part of J&K’s constitution deals with public grievances? 180) Which Part provides for amendment of Constitution? 181) Which Part of J&K Constitution Deals with Elections? 182) Which Section of J&K’s constitution deals with Rights of Women? 183) Who is the Head of the state in J&K , as per Section 26 of J&K’s constitution? 184) Which Section deals with “ Rights of Children”? 185) Which Part of Constitution deals with Transmonal Provisions? 186) Which Part of Constitution deals with The High court? 187) Can Union of India Declare Financial Emergency in J&K? 190) Which section provides for Protection of Governor? 191) Who has signed the Constitution of J&K into Law? 192) Which Schedule of Constitution deals with Oaths and Affirmations? 193) Which section provides for Organization of Village Panchayats? 194) Which Part of the Constitution deals with Public Services? 195) Which section Deals with the Public Service Commission of state? 196) Which article of Indian constitution gives autonomy to the state of Jammu and Kashmir ? 197) When J&K constituent Assembly was established? 198) When was J&K’s constitution adopted? 199) When did Constitution of J&K came into force? 200) Who was the chairman of Drafting Committee of constitution? In our upcoming post, we will share the Next Expected 100 Questions (201 to 300) for JKSSB Exam. If, you have any Queries, kindly ask us in the comments section below.